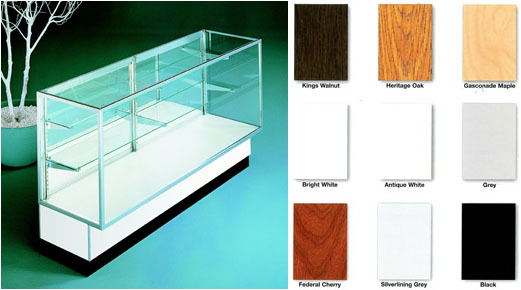 38"H x 20"D x 60"L. 26"H glass display area with two adjustable glass shelves; 1 - 8" deep and 1 - 10" deep. Recessed base is 16"D. Laminate colors available: Gasconade Maple, Heritage Oak, Kings Walnut, Black, Bright White, Antique White, Federal Cherry, Silverlining Grey & Standard Grey. Plunger Lock included.